Viknesh Vijayenthiran September 13, 2012 Comment Now! A couple of years ago Mercedes-Benz made the bold promise to launch an electric version of its SLS AMG gullwing supercar on the market by the end of 2013. 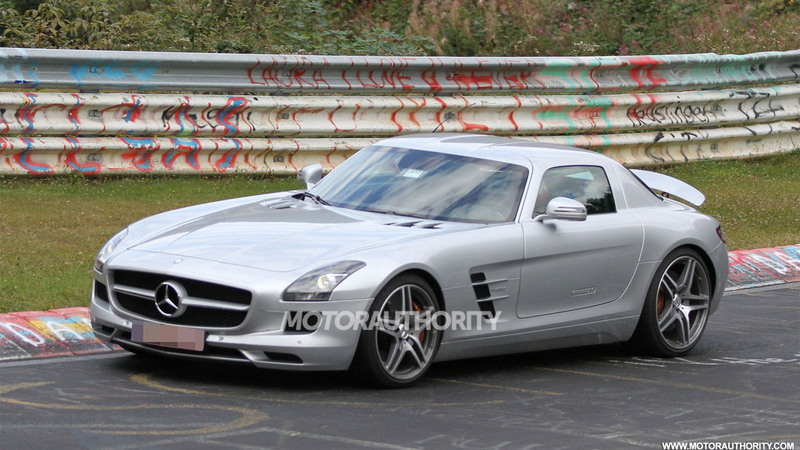 Since then we’ve seen several concept versions of the car, which has been labeled the SLS AMG E-Cell, though until now we’ve never actually seen one testing in public. 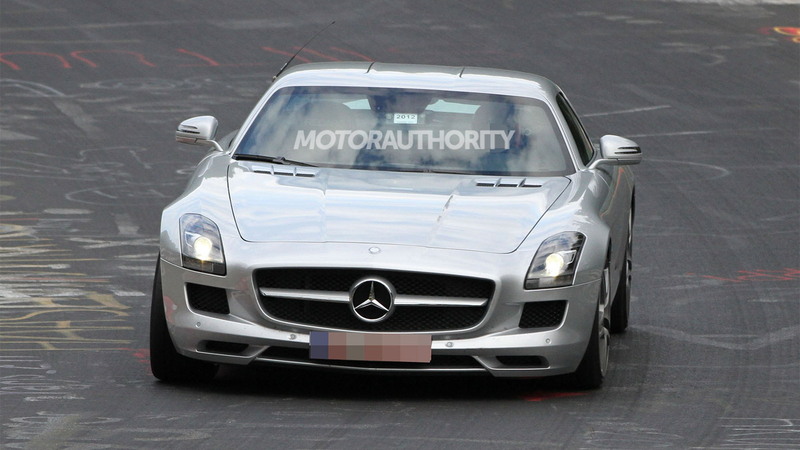 A prototype for the upcoming Mercedes-Benz SLS AMG E-Cell has now been spotted in Germany, conducting some high-speed tests on the Nürburgring and then later taking to some of the race track’s surrounding streets. Though the electric version of the SLS AMG looks identical to its gasoline-swilling sibling, there are a few subtle details that allow us to tell them apart. 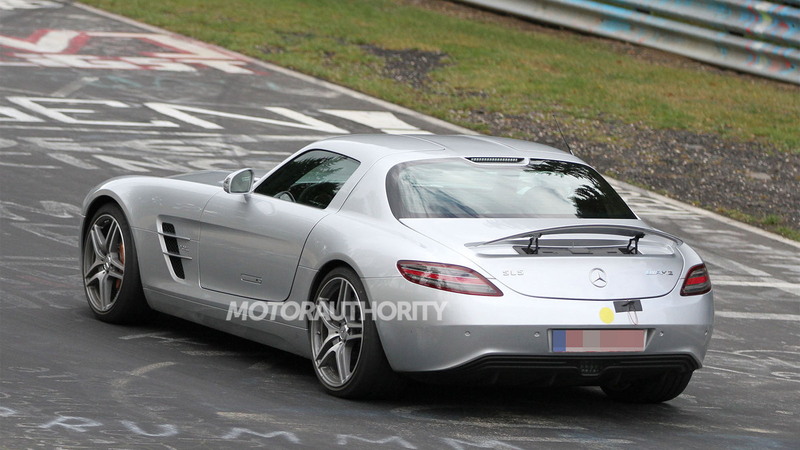 Most obviously, the SLS AMG E-Cell is devoid of any exhaust tips and features a small “E-Cell” badge on both its front fenders. The bumpers are also slightly different to the V-8 versions, particularly the rear one, and each of the doors appear to have a strange opening near the bottom. Initial specs call for an output of 525 horsepower and 649 pounds-feet of torque, the latter of which would be available from a standstill. This promises to deliver a 0-60 mph time of around 4.0 seconds, just 0.2 of a second slower than the V-8 version, however, top speed is likely to be limited to somewhere below 150 mph to help preserve battery life. Those specs are based on the original concept version’s four electric motor powertrain. Powering all four wheels has traction benefits, and torque vectoring from the individually-driven wheels means cornering characteristics can be adjusted almost infinitely. It’s unclear if the production version will feature this setup, though we certainly hope it does. 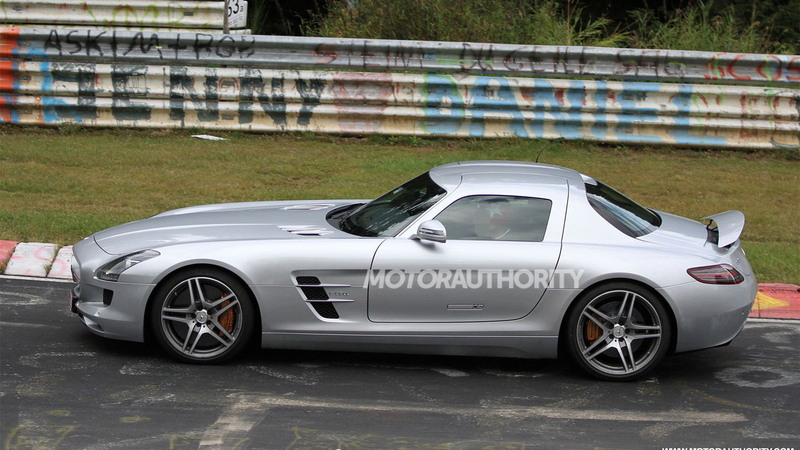 Having all-wheel drive capability should also help differentiate the electric gullwing from the V-8. Powering the electric motors will be a 324-cell lithium-ion battery pack rated at 48 kWh. No range has been mentioned, though with this level of performance something around 100 miles would be impressive. Helping charge the batteries while on the move will be a Formula 1-inspired kinetic energy recovery system. Housing those--heavy--batteries is said to be a full carbon fiber monocoque, another feature that should help the SLS AMG E-Cell stand out from the regular model. Though costly, adopting carbon fiber for the car’s central structure should help engineers achieve the high standards of performance implied by the AMG badge. Benefits include a weight saving of around 30 percent over standard aluminum, but high strength too. But the changes don’t end there. 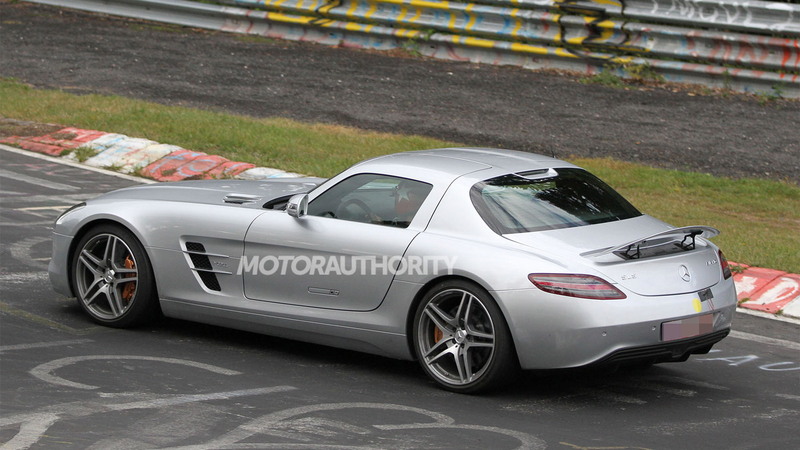 Racing-style pushrod shocks replace the vertically-arranged system in the regular SLS AMG, as the electric drive system--and the now driven front wheels--required a different axle setup. The brakes will be carbon ceramic units. Stay tuned for updates as development progresses. Next year is shaping up to be a big one for electrified supercars. Audi will be the first to launch its contender, the R8 e-tron due later this year, and this should be followed by the SLS AMG E-Cell from Mercedes-Benz, as well as BMW’s i8, Porsche’s 918 Spyder, the production version of the Jaguar C-X75 as well as the hybrid successors to the Ferrari Enzo and McLaren F1 supercars, the code-named F70 and P12.